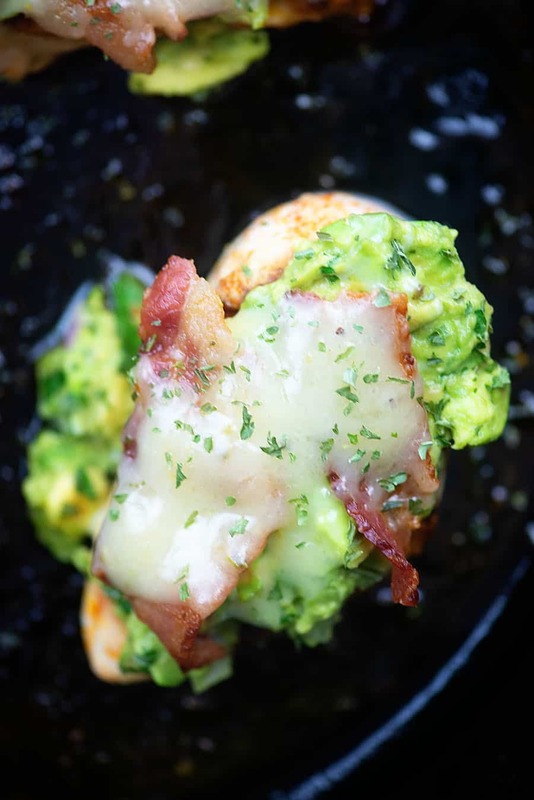 Guacamole chicken with strips of crispy bacon and loads of melty cheese. 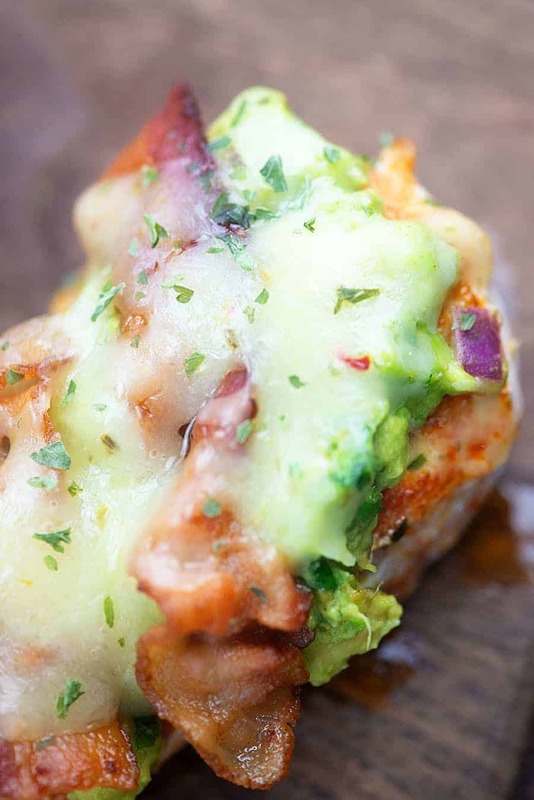 This low carb chicken recipe is sure to be a hit! Packed with flavor and really simple to throw together! Is anyone else out there totally obsessed with guacamole? It’s basically the perfect low carb food, if you ask me. Avocados are low in carbs, pack in some healthy fats, and they really manage to fill you up and stick with you. I regularly eat an avocado for breakfast and I love it! For dinner the other night, I whipped up some guacamole, spread it over some chicken breasts, topped it off with some strips of bacon, and finished it off with cheese. My family went NUTS for this recipe! I think yours will too! To start, season both sides of the chicken breasts with paprika, cumin, and garlic salt. I like to really coat the chicken with these spices to add tons of flavor! 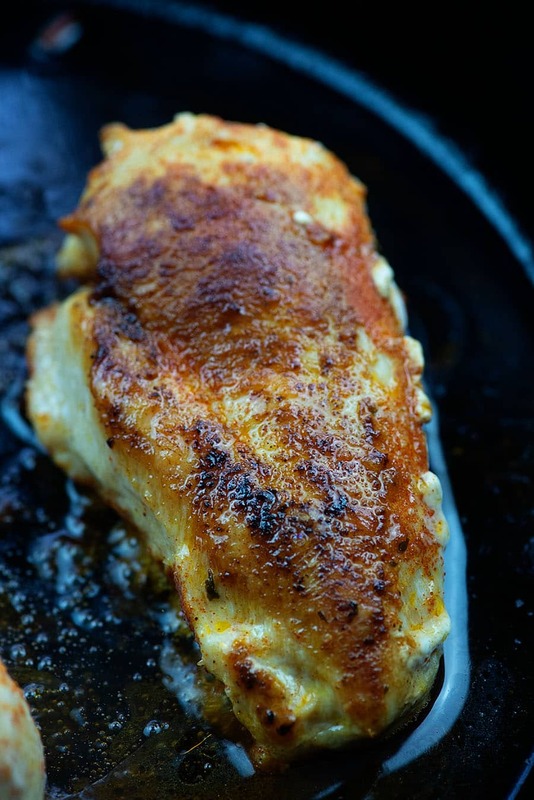 Heat some avocado oil in a heavy bottomed skillet, such as cast iron, and then add your seasoned chicken. Cook on each side for about 6 minutes or until the chicken is cooked through. While the chicken is cooking, work on your guacamole. Cut open two ripe avocados and scoop the flesh into a small bowl. Add in some diced red onion, minced cilantro, cumin, salt, and lime juice. This guacamole recipe is so simple, but it’s our favorite! Mash all of the mixture together with a fork. We like our guacamole to be just a bit chunky, but you can make it as chunky or as smooth as you prefer. 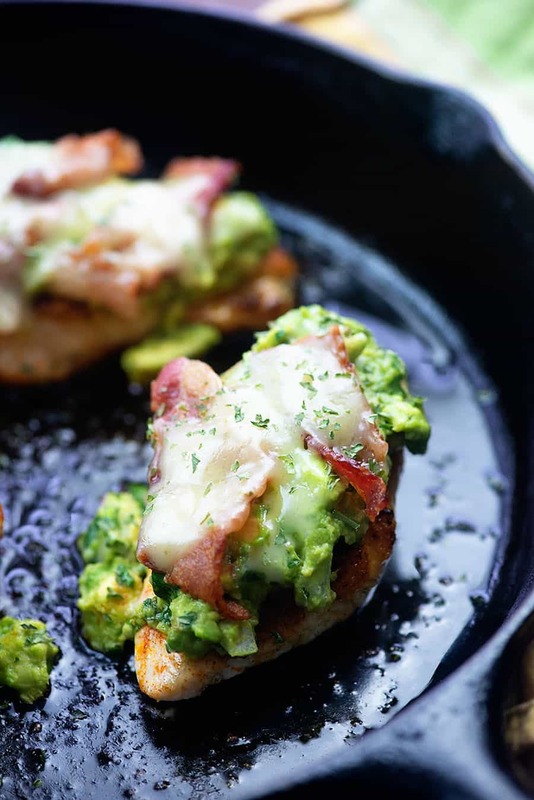 Once the chicken is cooked through, spoon the guacamole evenly over each chicken breast. Top with some crispy fried bacon. Finish it off with some grated pepper jack cheese. You could use any cheese you like here, but we really love the kick from the pepper jack. Place your lid over the pan and let the cheese melt. If you work quickly, the pan should still be hot enough to melt the cheese. If not, turn the heat on for 1 minute with the lid on to melt the cheese. Your guacamole chicken is done! Low Carb Taco Casserole: This ground beef casserole has been a favorite of mine for years! Low Carb Taco Soup: We love this soup and you can make it in the Instant Pot! Crockpot Chicken Fajitas: Slow cooker recipes are always a hit in our house. 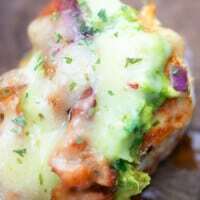 Mexican Lasagna: This twist on lasagna looks amazing! 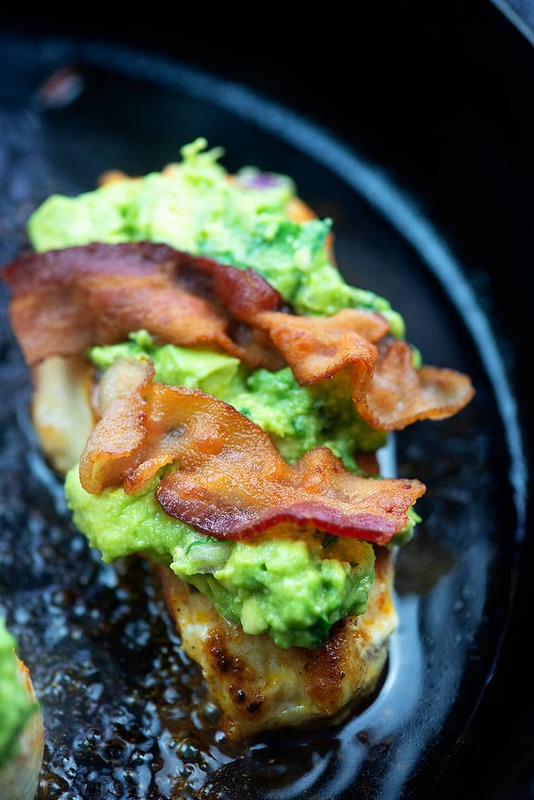 Seared chicken topped off with guacamole, bacon, and pepper jack cheese! 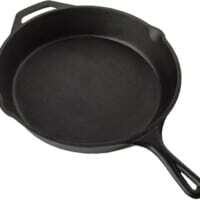 Add the oil to a large heavy bottomed skillet, such as cast iron, and heat over medium heat. Season the chicken with cumin, paprika, and garlic salt on all sides. Add the chicken to the pan and cook for 6 minutes per side or until the chicken is cooked through. Turn off the heat, but leave the chicken in the pan. While the chicken is cooking, prepare the guacamole. 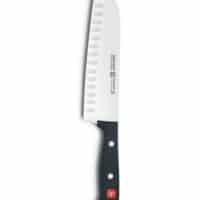 Add the avocado, red onion, cilantro, cumin, salt, and lime juice to a small bowl and mash together with a fork until the guacamole is as smooth as you'd like. Spoon the guacamole evenly over each chicken breast. Break the bacon pieces in half and lay 2 halves on each chicken breast. Sprinkle with the cheese. Cover the pan with a lid and let set for 2 minutes to melt the cheese. 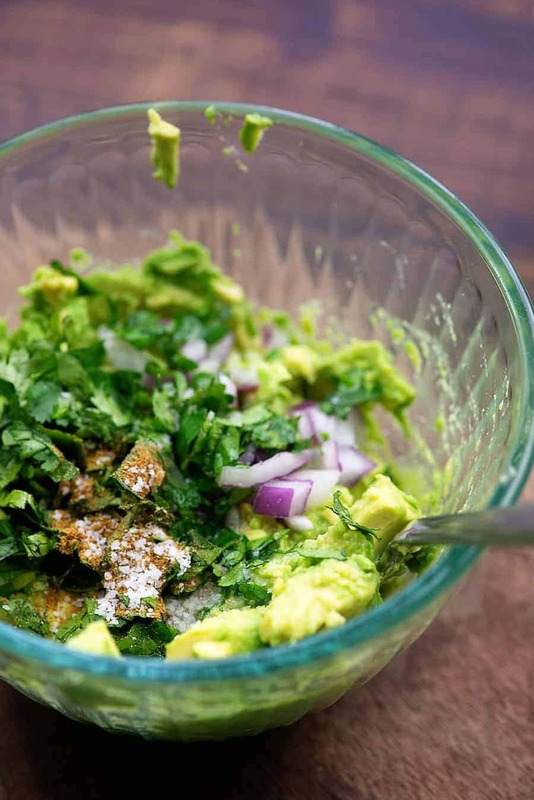 Use store bought prepared guacamole to make this recipe even easier! Nope, haven’t made yet but guess what we are having for dinner ?? !! Thanks for the recipe, it looks yummy. 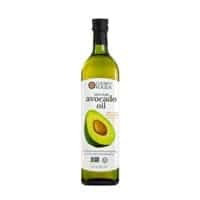 I do have a question, I have been trying to up my potassium naturally and avacado is supposed to have a significant amount. I don’t use a food app yet to track nutrition. What app are you using to get nutritional information if you don’t mind? Thanks again for this delicious sounding recipe, I plan to try it soon. OMGosh! Saving and sharing. This looks fantastic!! What do you serve as a side? I am making this tonight with long grain rice and a veggie. Made this last night and it was absolutely delicious! Only thing I did different was turkey bacon instead of regular bacon. My very picky 7 yr old couldn’t get enough. Thank you for the recipe! Your recipes are amazing! Somehow I stumbled on your website and this has become my bible to loosing weight and enjoying my meals! Thank you so much! Oh goodness, thank you Mary! So glad you’re enjoying the recipes! Made this last night and will be making it for a long time to come. I didn’t have chicken breasts so I used the boneless, skinless chicken thighs that I had in the fridge. FABULOUS. My husband is a diabetic. After he ate this his blood sugars only went up 5 points. No insulin needed. Thank you so much for sharing your talents with us.